This is a mapmaking competition entry from Shessar. 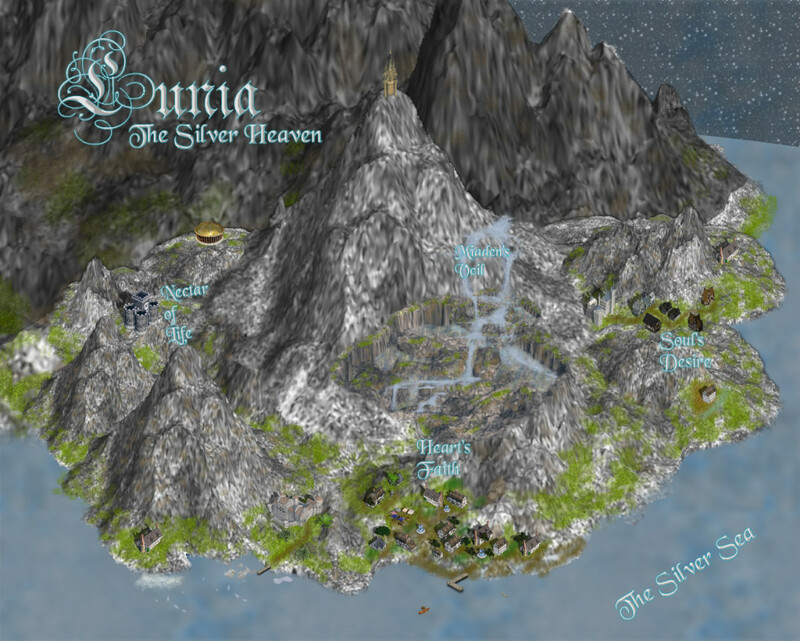 An isometric view of Lunia seemed the only way to capture the wonder of the first level of the Lawful Good plane of Mount Celestia. This map was created entirely in Campaign Cartographer using art from the Dundjinni User Art forums. Looks like a fun place and also looks like a video game. If only the terrain could be as sharply in-focus as the buildings. I love me some iso maps, and this one is no exception. I won’t belabor any points that Ascension has made. The transition between land and water is abrupt. The eye looks for a graduated change–the light reacting to what is below the surface, slowly fading as the water gets deeper. Your river looks like it’s flowing sideways in spite of a significant drop-off right next to it. Good use of light and shadow, and contrast between the rock and vegetation. A very interesting concept and lovingly executed. The difference in sharpness between the different areas/features is confusing to my eyes and unfortunately detracts somewhat from the over quality. I love 3d maps and you did a good job on chosing camera position and angle. This way you get a good view on the terrain and how the land is shaped. For the rendering I would have chosen a more detailled and variant texture (it’s rather rocky). For the city itself, I would have put in more houses and trees, to really make it tell the story of peace, beauty and endless wonders. Interesting idea. What distract me are the differences between the sharp and the blurred-looking elements. This is a heroic achievement in Campaign Cartographer. I am impressed with the result as I had no idea it could do iso maps like this. That said, this feels more like an illustration than a map. I can’t see a scale and there are locations that are clearly important that are not labeled. I’d like to see some paths – a heigh scale for the mountains, perhaps a legend. Also, that boundary between light and dark seems very important but has no description in the map – this left me wondering whether it was intentional or a graphical artifact? I think the artistry behind this map will take you far – but you also need to focus on the function. I really appreciate some of the input on this. This map was an experiment, and while the style needs perfecting, the response was better than I had expected. The blurriness of the mountains is certainly an issue, but since I was using PNG symbols created by another person, I had little control over it. Unfortunately, I didn’t have time to create my own mountains, since png art for maps is typically its own competition category. Still, it is obvious this was the biggest issue with the map. Another problem was my lack of a good writeup. Unfortunately, I had run out of time, and picked a subject that really required a detailed explanation. This probably would have eliminated the need for most of the comments that were made. Oopsie! The greatest benefit I think I’ve gained from this is an understanding of “how to compete”. I have always geared my maps to my players (including leaving some significant elements unlableled because that always makes them curious). I can see that when the judges are cartographers (fantasy or not) they aren’t thinking about the game, but about the map. Something I’ll remember if I ever decide to enter a competition again. I had fun with this, and really appreciate the time the judges took to comment as well as Jon’s generosity in offering prizes. Thanks guys!